Exploring Career Education Locally (EXCEL) Tours launched in the Spring of 2017 as a way to connect local high school students with businesses in Keith County. This career exposure will assist students in choosing a post-secondary education path and increase the likelihood of them returning to Keith County. 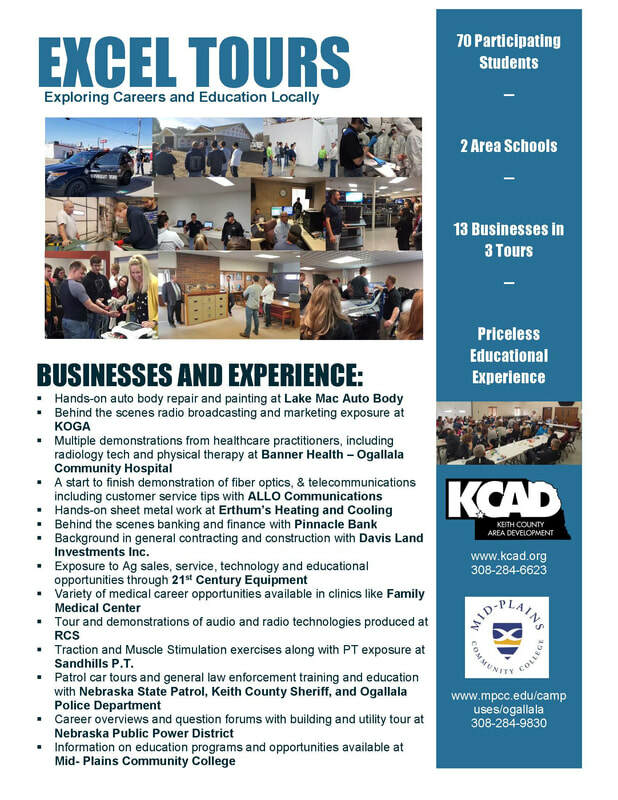 The partnership between KCAD, Mid-Plains Community College, and the local schools has produced three tours to date. The graduating class of 2018 has been connected with nine participating businesses, four in the spring as juniors, and five in the fall as seniors. While the graduating class of 2019 has completed the Spring tour, visiting 4 businesses. Students have gained knowledge in a vast array of careers which include: Banking, Auto Body, Sheet Metal Heating, Healthcare, Radio Broadcasting, Fiber Communications, Agricultural Technology, Radio and Audio Technology, Law Enforcement, Physical Therapy and Sports Medicine, Utility and Power, and Construction Management. Contact KCAD to become an EXCEL partner.